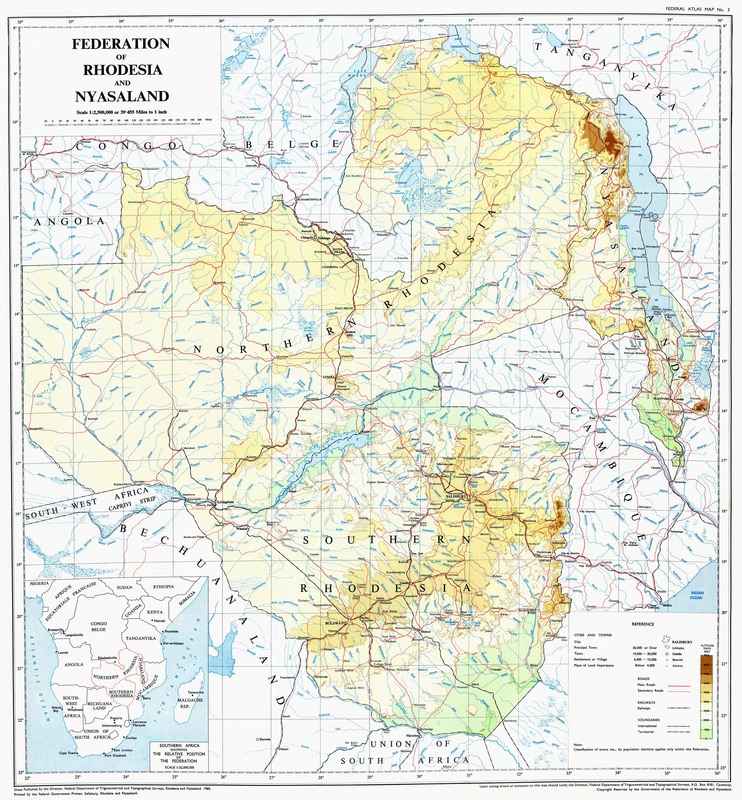 My Father, Ian Dickson, was appointed Medical Officer to the 1913 Boundary Commission between Angola and Northern Rhodesia. After one season helping establish and survey the frontier between Kalene Hill in the extreme Northwest and the 13th parallel he accepted the post of Medical Officer, Barotseland. This included the duties of Court Physician, or 'The White Nganka' as he was called, to Lewanika, the Paramount Chief. 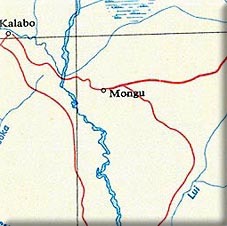 Mongu, meaning the Hill of the Dead, was the District headquarters and at that time home to ten European officials and four pioneering wives. A regular weekly mail taking 15 days from Livingstone by a relay of messengers kept them in touch with the outside world. Depending on the season, the journey up the Zambesi from Livingstone with kit and provisions took about a month, and sometimes more if your canoe or boat was upset in the river with all your worldly goods - a not uncommon occurence. It was the 16th August 1914 and a sleepy Sunday afternoon. My father was returning home from lunch with a neighbour when a weary, dust covered messenger trotted past him. It was an unusual sight. He did not recognise the messenger. He was carrying a cleft stick over his shoulder with a single letter thrust into it, which could only mean important news. He wore the look of a man approaching the end of a marathon. As it later transpired it had been more than a marathon; the 335 miles from Sesheke (by the then path) across rivers, through swamps and over deep soft sand in seven and a half days - an unsung homage to duty. There were immediate consequences. Firstly a stock-taking of weapons and resources to protect the station from German attack. All save five sickly Police and all but one of their few Maxims were sent to strategic points down river, leaving the remaining residents to sharpen up their skills on the rifle range. 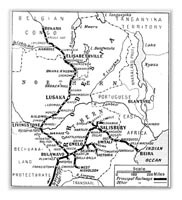 Lewanika sent runners 400 miles into German territory to learn of their intentions. French and German missionaries were called home for service, leaving their unfortunate wives to fend for themselves with little or no money in remote parts of the bush. Lewanika offered his standing army, reputed to number 5000, for an immediate invasion of German Southwest Africa. The offer was politely declined. My father, being an officer in the Army Special Reserve, immediately tendered his resignation, but was told in a most friendly manner by the Resident Magistrate that he would be put under arrest if he left before he could be relieved. It was not until mid-December that the relief arrived whereupon my father left for Livingstone immediately, but not before an unusually precious cargo had been put into his care. The following extract from his memoirs describes it; "My successor arrived in the middle of December, when I handed over to him and did a round of farewells. My friends, both black and white, were very kind and I left with a lion's claw, a lion's tooth, and some plaited hairs from an elephant's tail, all given to me by patients and guaranteed to protect me from all ills. It was decided that as the doctor was going down the river he should take the valuables with him. These were the tax money for the year, all in cash, and Mrs Salmon, the wife of our Police Officer who had led our contingent to war. Mrs Salmon was very young and seven and a half months pregnant, so that the journey was going to be an adventure for her, as was all her life in Africa. She had arrived as a bride in Livingstone about a year previously, where there was a great reception party given by her husband's friends. After the party was over they mounted their horses and rode off into the bush, following their carriers who had gone ahead carrying their tents and all their kit to find a suitable spot for the first camp. The bride and bridegroom rode on until darkness overtook them, when they had to stop, picket their horses, collect wood, make a fire and spend their first night in Africa alone and supperless in the bush. Next day they discovered they had taken the wrong trail and they eventually found their camp. Our belongings were packed into two boats, one for Mrs Salmon and one for me and the money. The treasure was packed in wooden boxes, with long cords and a bunch of corks attached so that they could be retrieved if we were upset. We had a splendid send-off and we sped rapidly down the river on the rising flood, our paddlers singing as they lifted the boats through the water with long, powerful strokes. Crocodiles lay on the sandbanks and squelched into the water as we passed. Hippopotami looked at us, raising their eyes and a little bit of snout above the water, and thousands of birds swirled above us. We pitched our tents at night on dry land if possible, and at other times on spongelike marsh. We ate our way through crates of hens which had been given us as a parting gift, the survivors roosting in bushes near the camp and being caught by the cook when we left in the morning. 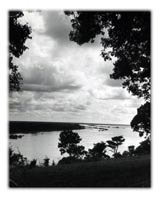 At times I had to stand waist deep in water to ease Mrs Salmon's boat round difficult bends, and at one place the boats had to be dragged overland by a span of oxen to avoid rapids and the Gonye Falls. We had a dinner party by the light of a hurricane lamp in Mrs Salmon's tent on Christmas Eve, 1914. The rain was falling in torrents but we were moderately dry and we enjoyed our dinner of the last chicken, which our boy had killed and managed to cook, a tinned plum pudding and a bottle of port. I was always amused by the way a boy could produce a good, hot and sometimes elaborate meal in a very short time with practically no equipment save a bake-pot and a few old biscuit tins, and on an open fire of wet wood which no white man could light, and he would bake fresh bread every day. That night the hippopotami squelched and grunted round our camp and we had to keep our hurricane lamps alight to discourage them from blundering into us. We reached Sesheke in very fast time, and I handed over the tax money to the Native Commissioner with considerable relief. Mrs Salmon and I continued our journey to Kasangula, where we had to leave the river and where we found awaiting for us a four-mule buggy, in which Mrs Salmon was to drive, and a horse for me to ride. We unloaded all our kit, divided it into loads for our paddlers to carry, and camped for the night prior to an early start. The distance to Livingstone was about 30 miles which we planned to do in one day, allowing our overloaded paddlers to take two or three days for the journey. At 4.30 am. we started, Mrs Salmon and her native driver bumping along the track and I, Cavalier like, riding beside them. A couple of hours later the rain began to fall in sheets. The going became heavy but we plodded on until the track became a quagmire and at last the buggy sank up to its axles in the mud. After a few ineffectual struggles the mules too sank, up to their bellies, and there was nothing we could do to move them. Mrs Salmon got out and mounted my horse and I walked beside her holding the stirrup leather and thinking of the twenty miles to go without food or shelter and of the unsuitability in time and place for a confinement. Mrs Salmon was always bright and cheerful under the most depressing circumstances, and if pre-natal influence counts that baby should be a topper. After we had tramped for two or three miles we found to our delight an ox wagon, also stuck in the mud, and the white man in charge comfortably asleep in his little tent nearby. He gave his warm tent to the very wet lady while he and I went back with his span of sixteen oxen and a long trek chain and all his boys to encourage my miserable mules. They were still lying there. We hitched on the trek chain, stirred up the mules, and dragged them and the tiny buggy, with much squelching and sucking, out of the bog until the twenty animals and the carriage reached firmer ground. Our relief did not last long. In a very short time the whole procession was floundering in mud again, and then all the oxen and the mules lay down and refused to try. The boys then made balls of clay, and kneeling down, a boy to each ox, they plugged its nostrils. Soon the animal plunged and struggled to its feet, and with some goading the whole train moved forward on to firm ground. We soon reached the wagon, where the driver and I spent the night under the tarpaulin while Mrs Salmon slept on his camp bed. In the morning the sun shone and we drove and rode into Livingstone in state, none the worse for our journey. Mrs Salmon got a train to Cape Town and a boat home where a baby was born on March 3rd. The baby became the mother of two children. I made my report to the P.M.O., and to the Governor, and then took train to the south, reassured in the knowledge that the war was not over and might even carry on until I was able to have a part in it."